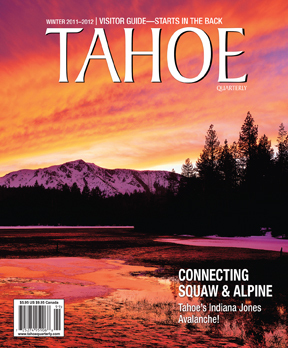 Tahoe is nothing if not eclectic. 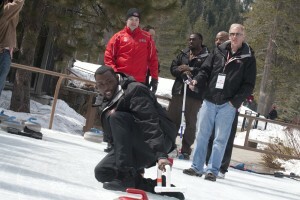 On Friday, Gold Medalist Peggy Fleming gave impromptu skating lessons on the Resort at Squaw Creek skating rink, where just hours later San Francisco 49ers greats past and present practiced their hand at curling alongside members of the U.S. National Team. What a place. 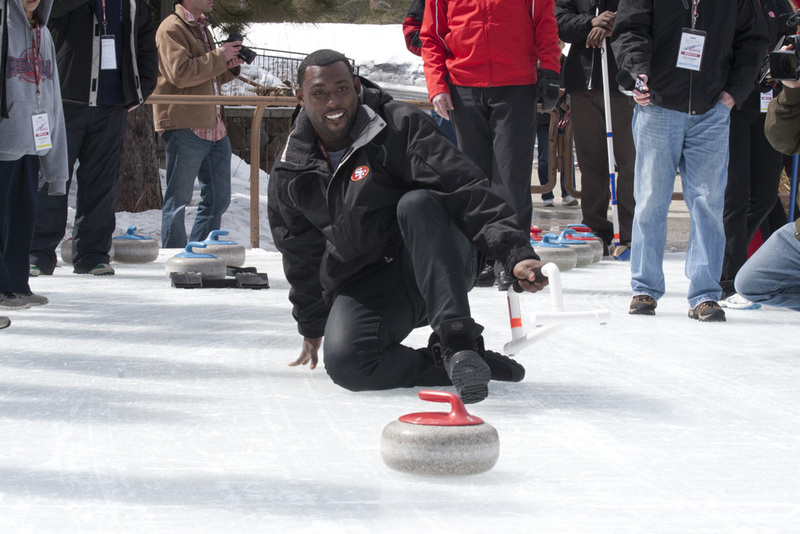 Niners' TE Delanie Walker tries his hand at curling. It was a great event, with loads of faces from the Niners past and present. I got to meet former DE Dennis Brown and his 1995 Super Bowl Ring. If you’ve never seen one of those things up close, WOW. 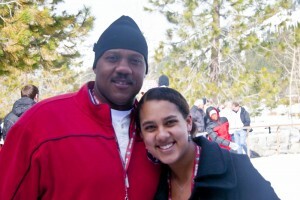 Here’s Dennis and his daughter. I also spoke with Geep Chryst, the 49ers Quarterback coach. 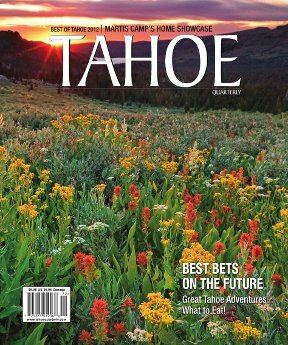 I’ve adopted the University of Nevada, Reno, as my college football team away from home over the past few years and became a big fan of former quarterback Colin Kaepernick, who is heading into his second year with the 49ers this fall. Chryst must have answered a million questions about the former Wolfpack standout, and readily admitted he was in “Kap country.” Kaepernick is starting to feel comfortable as a pro after a rookie season that saw him play 20 snaps and go 3/5 throwing, Chryst said. “We’re really pushing for him to be a starter at some point in this league,” Chryst told me. Alex Smith did go 14-4 last year, though, so don’t expect him take over for the presumptive starter quite yet. Another highlight of the day was getting to see Fleming, who casually skated around the rink and made time for everyone who wanted to say hi. 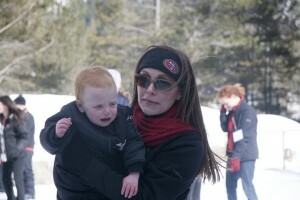 At 63, she skated better than pretty much everyone on the ice, and at one point stopped to take this little guy for a twirl. Needless to say, he was not sufficiently in awe. Celebrity was lost on this little guy, who didn't want to pose with Olympic Figure Skating Legend Peggy Fleming. Also making an appearance at the rink were members of the 49ers cheerleading team, the Gold Rush. They must have been everywhere, because at least half of the photos in my card featured them. The 49ers Gold Rush cheerleaders found varying degrees of success on skates. Apparently solid-ground dancing is slightly easier than ice dancing. Next, we curled. In case you’re uninitiated, curling involves pushing a large, smooth rock down an ice rink and landing it on a target at the other end. For the 60-plus crowd out there, think shuffleboard on ice. While the rock glides down the rink, two people with small push brooms clear the ice ahead of it in order to promote better distance and accuracy. It’s a Canadian sport that, right up until a few hours ago, I assumed required the athletic ability of competent city-league bowler. Not entirely true. Maintaining your balance on ice while competently pushing a large rock with enough distance and accuracy to hit the target is a small feat. Olympic curler John Benton (Let’s stop here. Curling is an Olympic sport. Giggle, then continue, please.) gave us a lesson in how to curl successfully, before not hitting the target and cursing the ice conditions at Squaw Creek. I am informed they do not possess a zamboni. Here’s, from left, the 49ers’ DT Ricky Jean Francois, TE Nate Byham and Walker taking in the tutorial. 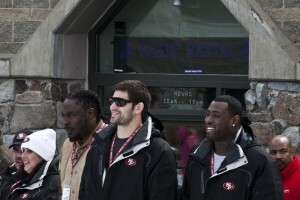 From left, 49ers players Ricky Jean Francois, Nate Byham and Delanie Walker. 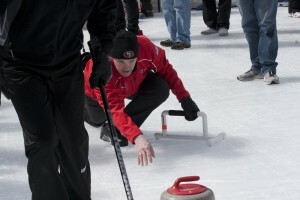 Much to my surprise, the NFL guys are actually pretty good curlers. I suppose athleticism translates across sport lines, but Byham and Walker looked pretty fluid out there. Walker was by far the best of the non-curlers. 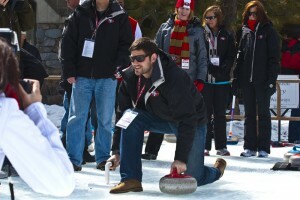 Nate Byham, professional football player, amateur curler. In all, a great way to spend a Friday. The foundation is in town throughout the weekend, and good luck to them as they continue to fundraise for a good cause.